Detailed set of scaled plans, enabling true "scratch-built" construction. Accurately scaled templates, allowing you to trace out and build to your choice of materials. Illustrated 12 page Generic Construction Guide plus 11 page Cardstock Modeling Guide. The Intellectual Property License Agreement allows you to print multiple copies for your own personal use, as well as construct multiple copies or variations, for your personal use, of each Plan purchased. * Pre-colored printable cardstock patterns are included as a free bonus and are not factored in to the cost of the plans. Colors may differ from models shown. Contact us for color information on individual plans. This gift certificate can be used to purchase several plans of up to a total retail value of $60. The certificate will be emailed to you as a PDF file, which you can then send to the recipient, or printed out and personally given as a gift. Instructions on redeeming plans are contained on the gift certificate. This gift is for: Please include first and last names. This information will appear on the personalized Gift Certificate, and YES, you can buy it for yourself! All plans will be registered to the recipient and cannot be re-distributed or shared. By placing order you agree to our Intellectual Property License Agreement. Click for details. Building a new Model Railroad layout? Want to get the most mileage for your money? 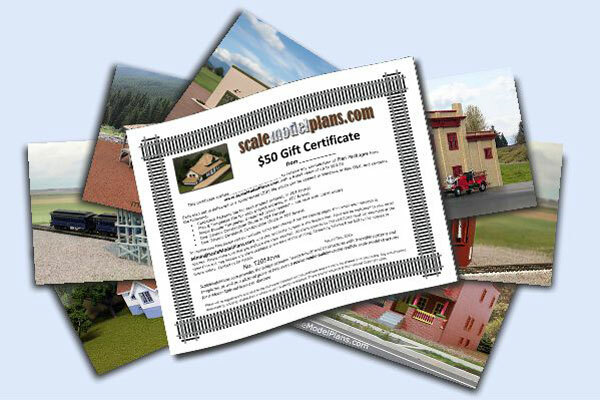 Our License Agreement allows you to build multiple instances of each scale model plan you purchase for your own layout. Not only can you build the included Cardstock version, in addition to a scratch built version using the included templates or scaled plans, but you can try the same model building plan using a variety of materials to create another unique model building. Check out these examples of the Plan 2455 - East Broad Top Railroad Blacksmith Shop.